Fruit is a quick and easy way of giving your body the goodness it needs to keep healthy. 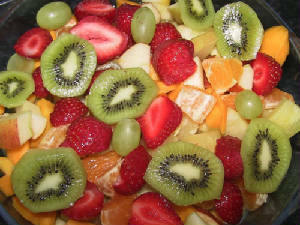 Fruit is also a great thing to give your kids - it makes a great healthy snack, instead of chocolate, sweets or crisps. Here are some of the more common fruits, but there are many, many more. Each fruit listed here also has its own recipe idea. VERY IMPORTANT: You should always wash fruit before eating it - either raw or cooked. To do this, simply rinse the fruit under a cold tap to remove any dirt or chemicals. Bananas are full of goodness. They give you energy and keep your body strong, meaning they're a snack that is healthy and filling. And because they're soft, they are easy to digest - making them a perfect food for weaning and perfect for when you're in a rush. For a healthy start in the morning, try adding slices of banana to a bowl of cereal. Oranges are one of the best sources of vitamin C - which helps you to stop getting ill. They are also very good for your eyes and bones, and contain folic acid, which is very important if you're pregnant. You can eat oranges segment by segment or cut them into quarters. Pears are good for your heart and your digestion. They also give you energy. You can eat them just as they are - like you would eat an apple - or cut them into chunks. Strawberries are one of Britain's favourite fruits. They're sweet, tasty, easy to prepare and very healthy. Strawberries are good for your heart, blood and bones. Preparing strawberries couldn't be easier - just remove the stalk and eat! Strawberries are not suitable for small children as they can cause allergic reactions. Peaches are a great healthy snack - they're especially good for your teeth and bones. To prepare, simply cut around the stone in the middle and the peach will come away in two halves.